■ Outfit - Emberotic's Fashion Designs by Emberotic Draconia - Bride of Frankenstein Horror Hunt Gift, October 1 to November 3. *Outfit comes with Face Scars (+Omega Appliers) ‖‖ Dress for Mesh (sizes XS to L) and Classic avatars (Alpha Layer) ‖‖ Mesh Hair that also comes with unrigged version. ✉ Emberotic's Fashion Designs - We Love To Blog Designer: Mainstore ‖‖ Satellite store ‖‖ Marketplace ‖‖ Flickr ‖‖ Flickr Group ‖‖ Facebook ‖‖ Blog. 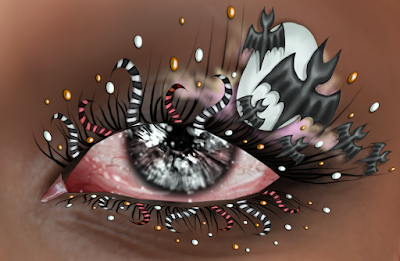 ■ Lashes - Venge by Vixn Dagger - Nightmare @ Suicide Dollz, open until September 30. *Compatible with Catwa heads ‖‖ 4 colors for 99L ‖‖ Follow Venge's Flickr and receive the Jack Lashes version for free! ✉ Venge: Mainstore ‖‖ Marketplace ‖‖ Blog ‖‖ Blog 2 ‖‖ Flickr ‖‖ Flickr Group ‖‖ Facebook ‖‖ Plurk. ■ Eyes - Cureless+ by Kaorinette - Allergic Eyes. ■ Bento head/Lipstick - Catwa by Catwa Clip - Catya (lipstick. ■ Ears - Swallow by Luciayes Magic - Punky. ■ Pose - BellePoses by Antonia Millar - Genji 1L. ■ Lighting - Foxcity by Satomi Masukami - Projector Light Thin Stripes + facelight @ Tres Chic.